Registration for the BIGGEST Training event of 2017 — Leader Education and Discovery (L.E.A.D) is now open. Bask in the warmth of friendliness and camaraderie of like-minded Scout leaders. Catch-up with old friends and meet new friends. This event is OPEN to all adults. You DO NOT have to be a uniform leader. Everyone is welcome to attend! Invest in the future – YOUR future success as a Scout leader, and the continuing interest and engagement of your Scouts depends on trained adults. New classes for 2017 include Cyber Chip for Cubs, Lion Guide 411, Fly Fishing Made Easy, Unit Finances and Unit Websites, etc. Every Scout deserves a trained leader so who you gonna call? Click here for class catalogs and more info. Class sizes are limited so register early ! 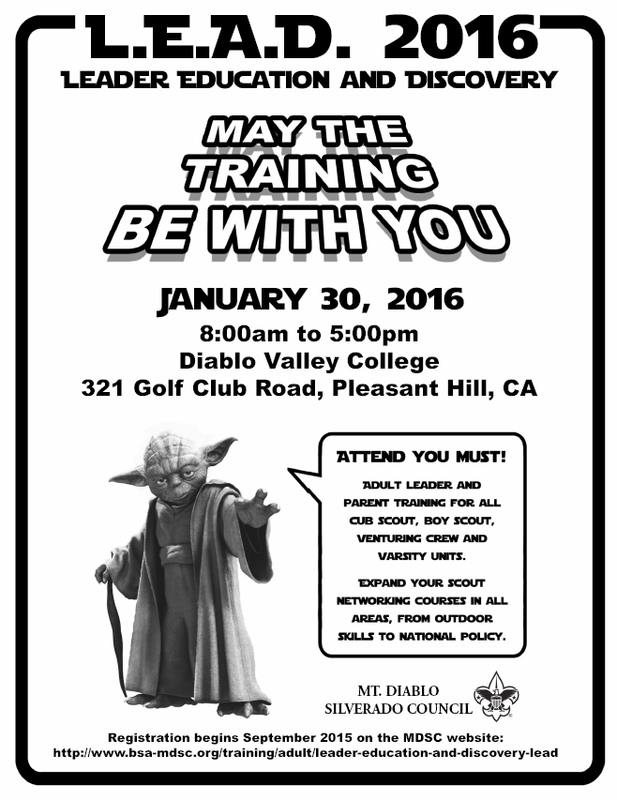 What better way to support Scouting than to attend TRAINING! Not just any training, but the BIGGEST Training event of 2016 -- Leader Education and Discovery (L.E.A.D). You can select up to six classes and go from class to class. Click on the course schedule and their descriptions to help with registration. Class sizes are limited so register early. Registration for LEAD (Leader Education and Discovery) on January 31, 2015 is now open. Visit the Council website to sign up, view course schedule and descriptions. Class sizes are limited so register early. Scout "Leader Education And Discovery" (L.E.A.D.) is a full day of relevant, inspiring, and required Adult Leader classes with sessions in all Scouting aspects, from outdoor skills to national policies. This is a great opportunity for all leaders to build their Scouting network. Visit http://www.bsa-mdsc.org/lead to sign up, view course schedule and descriptions. Class sizes are limited so register early. Save the date for L.E.A.D scheduled for Saturday, January 21, 2012. 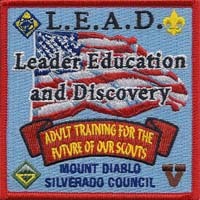 Scout "Leader Education And Discovery" (L.E.A.D.) is a full day of relevant, inspiring, and required Adult Leader classes held at Diablo Valley College in Pleasant Hill by MDSC. Dozens of sessions will be available to support leader competence in all Scouting aspects, from outdoor skills to national policies. This is also the best opportunity for leaders to build their network and be inspired by successful Scouters who have experience with issues and opportunities that are common in many units. More information about class schedules, instructors, and registration will be coming soon. While that is being finalized, we wanted to let you know about this important event so you can get it into your personal calendars immediately. We look forward to seeing you on January 21. 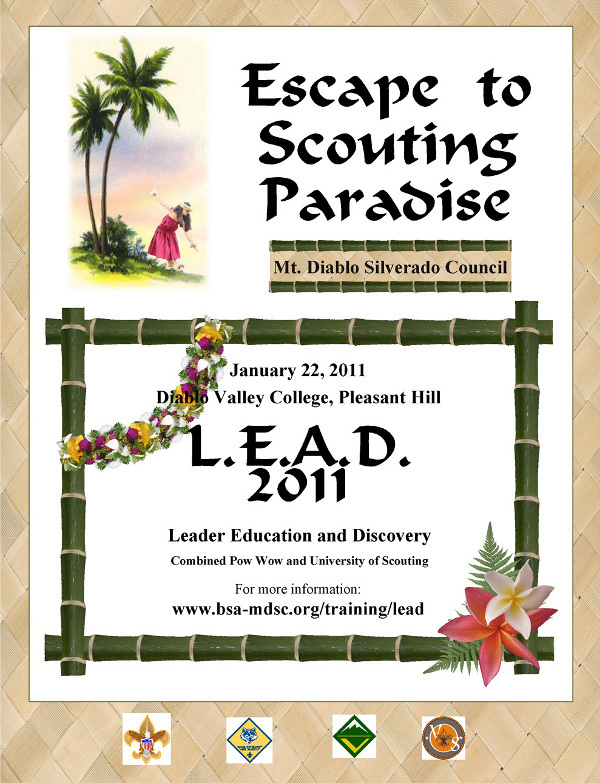 Scout "Leader Education and Discovery"
L.E.A.D 2011 – Online Registration Extended! L.E.A.D. "Leader Education and Discovery"
Diablo Valley College on Saturday, January 22, 2011. Online Registration for L.E.A.D. 2011 EXTENDED to 11:59PM on Monday January 17, 2011. If you have not registered yet, Register Now!! You don't want to miss out on hearing our fabulous Keynote Speaker - Mr. Chuck Smith - Silver Antelope recipient. We also have Lynne Leach speaking as our Council President. Visit http://www.bsa-mdsc.org/lead to sign up, view courses and the schedule. YOU DON’T WANT TO MISS THIS YEAR’S L.E.A.D. LUAU - EVERYONE WILL BE THERE! This is a GREAT OPPORTUNITY to LEARN more of what is available for your SCOUTING PROGRAM and to NETWORK with fellow Scouters and potential contributors from outside Scouting. Classes are available for leaders of Cub Scouts, Boy Scouts and Venturers. Subjects for NEW leaders as well as EXPERIENCED leaders are covered. Classes are available for you to fulfill leadership requirements and to enhance your knowledge of our programs. You will also be able to learn more about camping, cooking, paddling and exciting things to do with your Scouts. Did you know that every youth facing leader will need to be position specific trained by the end of 2011? You can get this training at L.E.A.D.!! The curriculum is designed to help you and your Scouts thrive! The Luau program features will give you new insights for Scouting opportunities! Invest in the future – YOUR future successes as a Scout leader, and the continuing interest and engagement of your Scouts. Join us at the Luau! LEAD 2011 Early Bird Registration Ending Soon! Registration for the annual MDSC Scouting conference is open and early bird discount is ending soon. LEAD is a full-day (7am-5pm) training with fun sessions on camping, cooking, paddling, website setup, and a lot more. You can enjoy all these classes for only $35 if you register by Dec 17th midnight, and this $35 is reimbursable by the Pack upon completion of the training. Go to the Council website for detail and registration. Mark your calendars for L.E.A.D. "Leader Education and Discovery"
Mt. 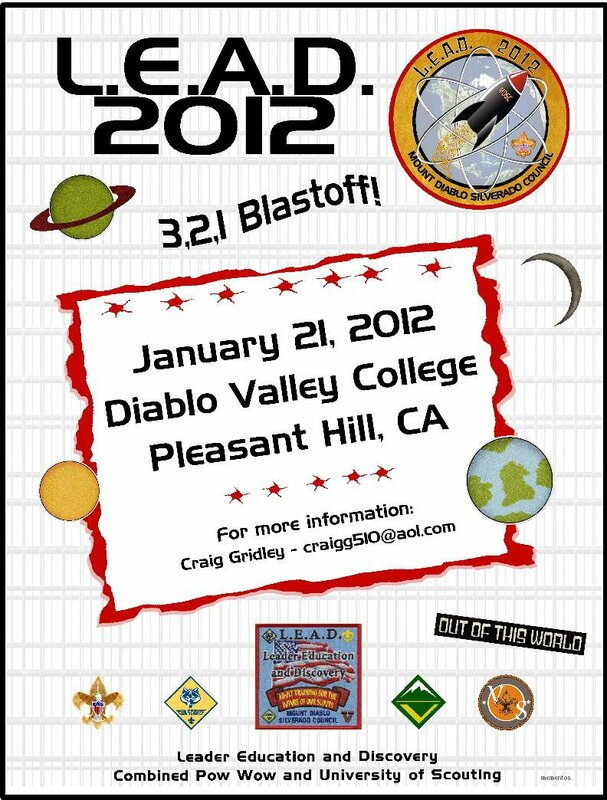 Diablo Silverado Council’s mid-winter escape to Scouting paradise will be held at Diablo Valley College on Saturday, January 22, 2011. Registration is now open – Early Registration Discount through Friday December 17, 2010 at midnight. Standard Registration through Friday January 14, 2011 at midnight. Online registration ends at midnight on January 14, 2011. Now is the time to get yourself registered for the greatest training event of the year. 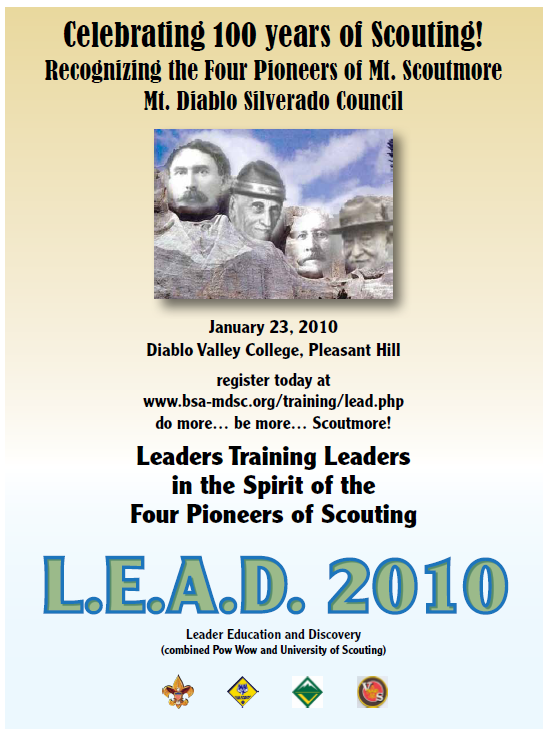 LEAD 2010 is coming up on January 23, 2010. Registration is now open at http://www.bsa-mdsc.org/training/lead/registration.php. From now to January 4, 2010 the fee is $37.00 including lunch. From January 5 to January 17 the fee is $52.00 including lunch. Please forward this to all of your scouting friends, as we don't want anyone to miss out on this great event.